Brian Gunia, PhD (Management & Organizations, Northwestern University) joined the Johns Hopkins Carey Business School in 2011. He is an Associate Professor in the research track. Brian studies three ways that people commonly jeopardize their careers: by acting unethically, negotiating ineffectively, and sleeping insufficiently. Instead of focusing on self-defeating choices themselves, however, he focuses on simple, theoretically-motivated measures that individuals can take to act more ethically, negotiate more effectively, and sleep longer or better. Brian is the author of a negotiation blog called Life's Negotiable and a negotiation book called The Bartering Mindset. 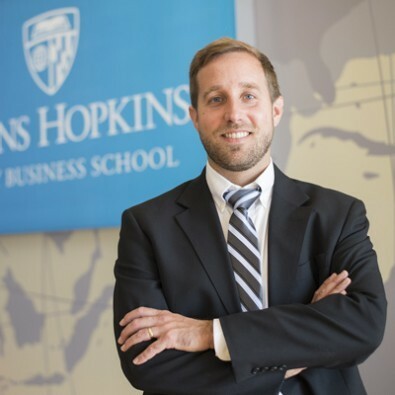 Brian founded the Johns Hopkins Business in Government (BIG) Initiative. Speaker Contest Winner, Next Generation of Government Training Summit, Arlington, July 2014. Gunia, B. C. & Levine, E. E. Deception as competence: The effect of occupational stereotypes on the perception and proliferation of deception. Organizational Behavior and Human Decision Processes. (in press). (Co-first authorship) Bhatia, N. & Gunia, B. C. “I was going to offer $10,000 but…”: The effects of phantom anchors in negotiation. Organizational Behavior and Human Decision Processes. (in press). Gunia, B. C. Ethics in negotiation: Causes and consequences. Academy of Management Perspectives. (in press). Gunia, B. C. Deceptive negotiating: The role of the environmental cue. Academy of Management Perspectives. (in press). Gunia, B. C. The sleep trap: Do sleep problems prompt entrepreneurial motives but undermine entrepreneurial means? Academy of Management Perspectives. (in press). Sun, X., & Gunia, B. C. Economic resources and corporate social responsibility. Journal of Corporate Finance. (in press). Brett, J. M., Gunia, B. C., & Teucher, B. M. Culture and negotiation strategy: A framework for future research. Academy of Management Perspectives. (in press). Adler, A. B., Gunia, B. C., Bliese, P. D., Kim, P. Y., & LoPresti, M. L. (2017). Using actigraphy feedback to improve sleep in soldiers: An exploratory trial. Sleep Health: Journal of the National Sleep Foundation, 3(2), 126-131. Gunia, B. C. & Kim, S. Y. (2016). The behavioral benefits of other people’s deviance. Group Processes & Intergroup Relations, 19, 653-675. Gunia, B. C., Brett, J. M., & Gelfand, M. J. (2016). The science of culture and negotiation. Current Opinion in Psychology, 8, 78-83. Rousseau, D. M. & Gunia, B. C. (2016). Evidence-based practice: The psychology of EBP implementation. Annual Review of Psychology, 67, 667-692. Gunia, B. C., Sipos, M. L., LoPresti, M., & Adler, A. B. (2015). Sleep leadership in high-risk occupations: An investigation of soldiers on peacekeeping and combat missions. Military Psychology, 27(4), 197-211. Pascual-Ezama, D., Fosgaard, T. R., Cardenas, J. C., Kujal, P., Vesztag, R., Gil-Gomez de Liano, B., Gunia, B. C., et al. (2015). Context dependent cheating: Experimental evidence from 16 countries. Journal of Economic Behavior and Organization, 116, 379-386. Barnes, C., Gunia, B. C, & Wagner, D. T. (2015). Sleep and moral awareness. Journal of Sleep Research, 24, 181-188. Gunia, B. C., Barnes, C. M., & Sah, S. (2014). The morality of larks and owls: Unethical behavior depends on chronotype in addition to time-of-day. Psychological Science, 25(12), 2272-2274. Gunia, B. C., Swaab, R. I., Sivanathan, N. & Galinsky, A. D. (2013). The remarkable robustness of the first-offer effect: Across culture, power, and issues. Personality and Social Psychology Bulletin, 39(12), 1547-1558. Gelfand, M. J., Brett, J. M., Gunia, B. C., Imai, L., Huang, T. J., & Hsu, B. F. (2013). Toward a culture-by-context perspective on negotiation: Negotiating teams in the U.S. and Taiwan. Journal of Applied Psychology, 98(3), 504-513. Gunia, B. C., Wang, L., Huang, L., Wang, J., & Murnighan, J.K. (2012). Contemplation and conversation: Subtle influences on moral decision making. Academy of Management Journal, 55(1), 13-33. Gunia, B. C., Brett, J. M., Nandkeolyar, A., & Kamdar, D. (2011). Paying a price: Culture, trust, and negotiation consequences. Journal of Applied Psychology, 96(4), 774-789. Thompson, L. L., Wang, J., & Gunia, B. C. (2010). Negotiation. Annual Review of Psychology, 61, 491-515. Gunia, B. C., Sivanathan, N., & Galinsky, A. D. (2009). Vicarious entrapment: Your sunk costs, my escalation of commitment. Journal of Experimental Social Psychology, 45(6), 1238-1244. Cohen, T., Gunia, B. C., Kim, S. Y., & Murnighan, J. K. (2009). Do groups lie more than individuals? Honesty and deception as a function of strategic self-interest. Journal of Experimental Social Psychology, 45(6), 1321-1324. Gunia, B. C. (2019). The Bartering Mindset: A Mostly Forgotten Framework for Mastering your Next Negotiation. Toronto: University of Toronto Press.